Our acute hospital partners save your life, Bruyère gives you back your quality of life. As one of the largest health care centres of its kind in Canada, Bruyère plays a key role in addressing the health care needs of the aging population in the Champlain region, offering complex continuing care, geriatric rehabilitation, stroke rehabilitation, palliative care, long-term care and affordable housing for seniors. We complement the care provided in acute care facilities by facilitating the transition between health care settings, and eventually, helping the diverse population we serve return to the community. Care is provided through our three sites, Élisabeth Bruyère Hospital in the Byward Market, Saint-Vincent Hospital in Centretown, and Bruyère Village in Orleans. We strive for excellence and innovation through teaching, education and research aligned with our clinical priorities. Brain Health & Memory: By investing $10 million in research, innovation and patient care, Bruyère will reduce the incidence of dementia by 50 per cent within the next 20 years. Care of the Elderly: Bruyère will redefine the experience of aging through a $10-million investment that will improve quality of life and allow seniors to stay independent and in their homes as long as possible. Rehabilitation: An investment of $10 million in research, technology and expanded patient care programs will help even more people who require stroke and geriatric rehabilitation. More than 600 volunteers are part of the Bruyère family. Each one is valued and plays a vital role in providing exemplary and deeply compassionate care and services to our patients, residents, clients, tenants and their families. As essential members of our health care team, volunteers share their energy, skills and expertise in helping us fulfill our mission of improving the quality of life of those we serve. Volunteers truly make a difference in their lives. To apply, please call us at 613- 562-6262, ext. 8250 or email volunteer@bruyere.org. Bruyere's Life Changing Breakfast allows guests to hear personal stories from members of our community that illustrate how their lives have been given back, thanks to the caring teams at Bruyère. 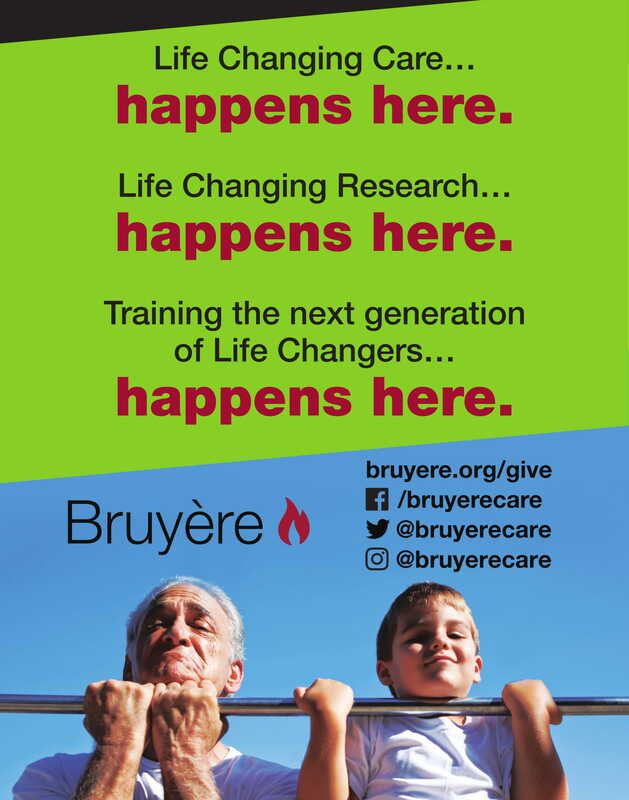 Bruyère's Life Changing Day is scheduled for Thursday, May 23, 2019 at Saint-Vincent Hospital. Join us for a day of learning, sharing and storytelling as we inspire our community with how we change lives at Bruyère. Broadway for Bruyère presents Come From Away - A New Musical, Thursday, Aug. 29, 2019 at the National Arts Centre. Bruyère's electrifying signature event brings out Ottawa's movers, shakers and live music aficionados for the highly anticipated fifth edition of Broadway for Bruyère! Vaive and Associates Professional Corp.